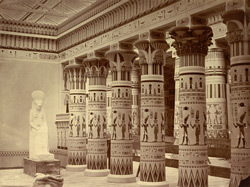 Reproduction of the Grand Portico of the Temple of Philae in the Egyptian Court, designed by Joseph Bonomi and Owen Jones at the reconstructed Crystal Palace exhibition hall. Philae comes from the Greek meaning "end" and this temple defined the southernmost boundary of Egypt. It was dedicated to the Goddess Isis, wife of Osiris and mother of Horus.